Token Reporter covers the world of cryptocurrency, token sales, and early stage startup funding. It is edited by John Biggs, formerly of the New York Times, Gizmodo, and TechCrunch. 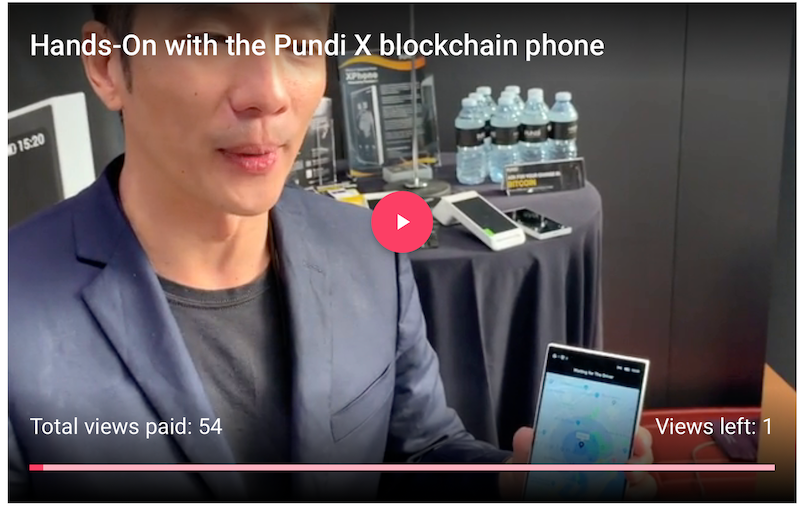 We just posted a great video with the CEO of Pundi whose latest device, the “bitcoin phone” is an interesting effort at making real blockchain hardware. Check it out here. Financial literacy is a hell of a thing. It isn’t really taught in schools, other than the odd project some teachers do on stock trades. No one really teaches personal finance practices, or teaches how banks work, beyond a week or so in social studies watching some scratched old filmstrip about how a credit union differs from a bank. So as crypto and blockchains come into being, they’re at a unique opportunity to replace the old cruft with new systems that are potentially more sanely designed. At the same time, there’s a lot of people who plan nothing more than replacing the old way with a new way that slots right in. We see it with the notion of “stablecoins”. A stablecoin is a currency pegged to another stable asset, like the US dollar. The idea is, by making the coin pegged to something non-volatile, the currency gains stability, and reduces financial risk. As you might expect, this causes a lot of frustration among people who worry about whether or not things are decentralized enough. A stablecoin based on a government-issued currency is centralized. A stablecoin based on another cryptocurrency would probably be decentralized, presuming that other currency was sufficiently decentralized. JP Morgan’s stablecoin appears to be positioned to increase settlement efficiency for cross-border transactions, securities transactions, and could be used by large international corporations to replace the funds businesses hold around the world in subsidiaries. What remains to be seen is whether or not it actually gets used for any of these functions. Typewriter.Plus offers white paper editing, website proofreading, and presentation management for startups. Our rates are low and our experts have worked at the New York Times, Gizmodo, and other amazing tech sites. Upload your document today or try our inexpensive Startup Pitch Pack. Protecting over 1 million Crypto traders, investors and enthusiasts from fraud, MetaCert is the leader in crypto cyber security with easy-to-install anti-phishing tools. Try MetaCert for free. HypeHop.com is an experimental video site that pays you cryptocurrency for watching videos. It’s no-strings, and simple. Pick a video that interests you. Keep your eyes on the screen and enable your webcam. Watch. That’s it. Facebook is “hoping to succeed where Bitcoin failed” is the line quoted in a report by the NYT. The idea is, with Facebook merging WhatsApp, FB and instagram, they could use their own coin as a payment system across all three platforms. It’s said to be a stablecoin tied to three different nation’s currencies. They aren’t the only messaging platform working on such a thing, Telegram had their ICO rounds and is working on TON, the Telegram Open Network blockchain. How do you guard an election from meddling seems to be a question on the minds of a lot of Americans. In Moscow, they have an answer: Tass is reporting that a bill has been submitted to protect local elections using blockchain technology. The deputy of ruling party United Russia, Dmitry Vyatkin, emphasized that the technology would keep storage of the personal data of voters and the results of voting separate. “It will be impossible to connect them. This is exactly how blockchain technology works.” He insists that it would prevent electoral fraud.